Graduating from Woodward School for Boys in 1930, L. Ron Hubbard enrolls at George Washington University. Here he studies engineering and atomic and molecular physics and embarks upon a personal search for answers to the human dilemma. His first experiment concerning the structure and function of the mind is carried out while at the university. L. Ron Hubbard joins the 20th Regiment, Company G of the US Marines, becoming a drill sergeant and turning out a prize-winning company. He performs as the balladeer for the local radio station WOL and writes serial drama shows. He also becomes a surveyor as part of a team sent to verify the Canadian/US border in Maine. Taking his thirst for adventure to the skies, he is introduced to glider flying and quickly becomes recognized as one of the countrys most outstanding pilots. With virtually no training time, he takes up powered flight and barnstorms throughout the Midwest. Due to reports he files on airport conditions, twelve unsafe airports are closed. A national aviation magazine reports that L. Ron Hubbard set a national soaring record for sustained flight over the same field. Writing for the nationwide Sportsman Pilot magazine, L. Ron Hubbard details the latest aviation developments and advises fellow pilots on flight procedures in adverse conditions. He helps run the university flying club and is secretary of the George Washington University chapter of the American Society of Civil Engineers. As an editor and writer with the college newspaper, The University Hatchet, he writes his first published fiction story, Tah. He also wins the Literary Award for the best one-act play, The God Smiles. In the spring of 1932, L. Ron Hubbard organizes and heads the Caribbean Motion Picture Expedition. The two-and-a-half-month, 5,000-mile voyage aboard the 200-foot, four-masted schooner, Doris Hamlin, proves a unique and rewarding experience for over fifty college students. The voyage collects numerous floral and reptile specimens for the University of Michigan, and photographs are sold to the New York Times. 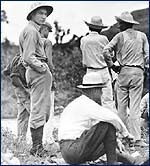 Shortly after L. Ron Hubbards return to the US he embarks on another adventure, the West Indies Mineralogical Expedition. Through April of 1933, he not only completes the first mineralogical survey of Puerto Rico, but writes articles for Sportsman Pilot magazine on flying through the Caribbean islands. He additionally investigates and explores some of the areas diverse cultures and beliefs, including that curious blend of Catholicism and voodoo known as Espiritismo. Returning to the mainland in the spring of 1933, L. Ron Hubbard begins his professional fiction-writing career. L. Ron Hubbard writes a story a day and after a few short weeks of work nets his first sale to New York publishers. February 1934 sees the publication of L. Ron Hubbards first adventure fiction story, The Green God. L. Ron Hubbard writes western, detective, adventure, action, and even romance stories. In 1935 he is elected president of the New York chapter of the American Fiction Guild, offering leadership to such stellar names as Raymond Chandler, Dashiell Hammett and Edgar Rice Burroughs. In his capacity as president, he also pens articles for writer magazines. He appears on radio shows advising both novice and professional colleagues on how to improve the quality and salability of their stories. Illustrating his prolific output as a writer, he completes 138 novels, novelettes and short stories in six years in just the genres of adventure, action, western, mystery and detective. This is an average of over one published story every two weeks, three times the output of most other writers. So great is his production in so many varied styles and genres that he employs numerous pseudonyms so as not to dominate too many magazine covers. Among them: Winchester Remington Colt, Lt. Jonathan Daly, Capt. Charles Gordon, Bernard Hubbel, Michael Keith, Legionnaire 148, Rene Lafayette, Ken Martin, B.A. Northrup, Scott Morgan, Kurt von Rachen, Barry Randolph, Lt. Scott Morgan, Legionnaire 14830, Capt. Humbert Reynolds. So intense is the demand for L. Ron Hubbards stories, that one complete issue of Top-Notch magazine is entirely written by him. In 1936 he writes his first book, Buckskin Brigades. L. Ron Hubbards popularity is now such that Hollywood seeks film rights to his stories and then enlists his services as a writer. After purchasing film rights to his novel, Murder at Pirate Castle, Columbia Pictures requests that he adapt this work for the screen under the title Secret of Treasure Island. Arriving in Hollywood in May 1937, L. Ron Hubbard begins work on Secret of Treasure Island and goes to work on three other big screen serials for Columbia: The Mysterious Pilot, The Great Adventures of Wild Bill Hickok and The Spider Returns. L. Ron Hubbard thus works on four of Columbias big screen super serials. In his ten weeks in Hollywood, he not only writes over a quarter of a million words of scripts, but also continues producing for his New York editors. Upon returning to New York, executives from Street & Smith, one of the worlds largest publishing concerns, enlist L. Ron Hubbards expertise for their newly acquired magazine, Astounding Science Fiction. L. Ron Hubbard is asked to help boost sagging sales with stories about real people  not robots, planets and spaceships. He accepts their proposal and the face of science fiction is changed forever. His first science fiction work, The Dangerous Dimension, appears in the July 1938 issue of Astounding Science Fiction. Among other L. Ron Hubbard stories appearing in the pages of Astounding is the much acclaimed Final Blackout which is later released as a best-selling book. In 1939 Street & Smith launch a second new magazine, Unknown, and it is soon filled with L. Ron Hubbards fantasy writings which could not be accommodated in Astounding. His first story in this genre is The Ultimate Adventure, appearing in the April 1939 issue. Many more L. Ron Hubbard fiction works appear for the first time in Unknown including such legendary stories as Fear, Deaths Deputy, Typewriter in the Sky and Slaves of Sleep. These stories are subsequently released as books in their own right.